The wind was already blowing when I launched my kayak, but I hugged the shore and made steady progress. A strange object was bobbing up in the river ahead of me. As I got closer I realized it was an otter chewing happily, biting off mouthfuls of salmon caught in a fisherman’s net. As i paddled through Hood River I noticed people appearing to be walking out most of the way across the river; obviously there was a sand spit ahead. I rounded the point of the spit apologizing to two fishermen casting off the end. It was like a different river on the windward side. The wind had come up even more so I didn’t dare beeline it upriver, instead I decided to follow the shore just in case I had problems. It was sketchy enough so I decided to land, which meant that the surf was pounding my boat as I was trying to crawl out. It looked like the sand of the spit might be firm enough if I stayed near the edge of the waves. I assembled my boat cart and it pulled fairly well. When I got near the main shoreline the wavesdissipated and I followed the the shore without incident. There was a stretch of river filled with stumps and a few logs sticking up, some stumps barely under the surface were only visible because waves were breaking over their tops. It was only about 10 o’clock when the waves were building enough so that I was looking for a potential campsite. I saw a forested point with a sandy beach. It looked perfect but when I got closer there was a sign that said Private Property. I paddled around the point, which I wasn’t crazy about, and made it just fine to the next point down the river. Here was another nice landing spot with Pondarosa pines. I crawled out of my boat, soaked from the waves despite my spray skirt, and scouted the area. Stellers Jays were flying around with their beautiful blue plumage, a range of blues from indigo to royal blue. Yesterday I had seen Scrub Jays. Down at the beach I put out my solar chargers and spread out various wet items to dry in the nice sun. There were acorns on the beach, back to oaks! 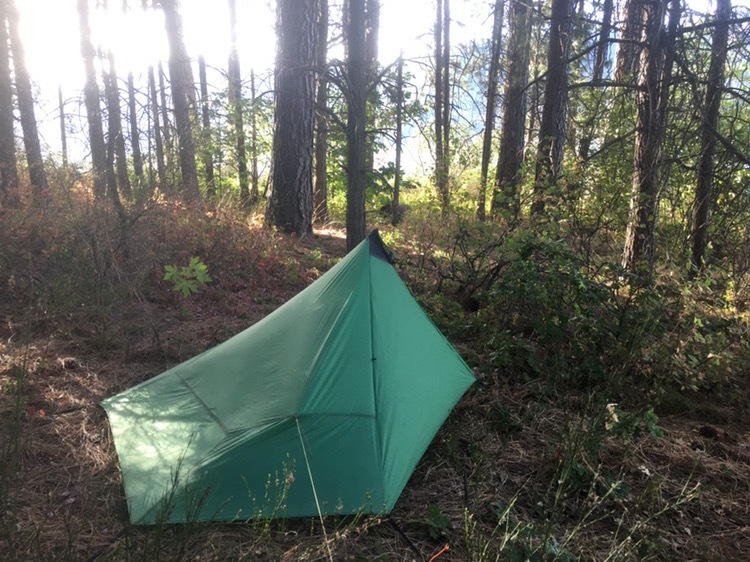 I pitched my tent in a nice deep bed of dry ponderosa pine straw. Just beyond I noticed some poison oak. I walked around a bit. The peak of blackberry season is done but I managed to find a few ripe ones. Kiters and windsurfers appeared and were zipping around like a yellow jacket nest that it just been kicked. I couldn’t help but think about the fact that they were getting on the river just as I was getting off the river. A few days ago my shirt caught on a branch stub and I ripped a considerable hole in the sleeve. Months of wear and sun exposure had weakened the material. I sewed a couple pieces of duct tape on the inside of the sleeve with dental floss. Clark: October 29th Tuesday 1805… at the upper village… This chief gave us to eate Sackacommis burries Hasel nuts fish Pounded, and a kind of Bread made of roots—we gave to the Women pices of ribon, which they appeared pleased with—those houses are large 25 feet Sqr and contain abt. 8 men, Say 30 inhabitents-Those people are friendly gave us to eate fish Beries, nuts bread of roots & Drid beries and we Call this the friendly Village We purchased 12 dogs of them & 4 Sacks of Pounded fish, and Some fiew Dried Berries …The robes of those Indians are, of wolf deer Elk, wild cats, Some fox, & Deer I saw one of the mountain Sheep, th wool thick and long Corse hair on the back, resembling bristles—those animals live among the rocks in those mountains below, orter is much valued by those people they Cew their hair on each Side with it and ware it about the necks with the tail in front C… they were pleased with musick of th violin.